Do you know who are Tony and Maureen Wheeler? Most of you have probably read the book published by his company. 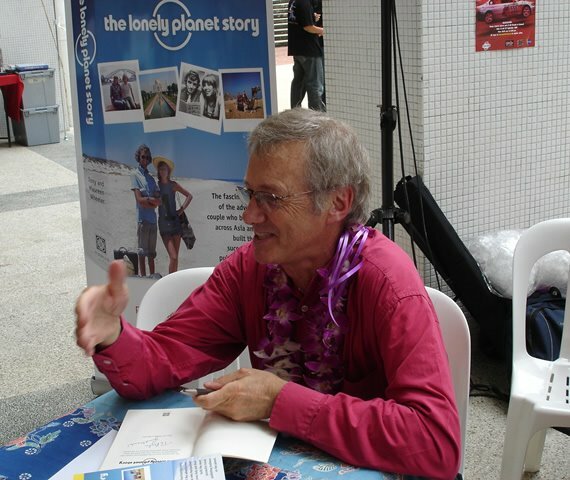 They are the founders of Lonely Planet. Here's a picture of Tony. This afternoon he was having an autograph session. I bought the book and had it Tony autograph it. It is someone's birthday gift actually. Hope that person will like it. Such a coincidence. I had a "Best of Sydney" lonely planet book and brought it to work today for a colleague who is going for a conference in Sydney in a few days time. I do that before too. Nowdays I will read a few pages, if I like it I buy it. Hey, well done, that'll be such a fantastic present. Top stuff! Wouldn't miss a 'lonely planet' book...mostly i read it in the library :) i like 'DK eyewitness' books too!